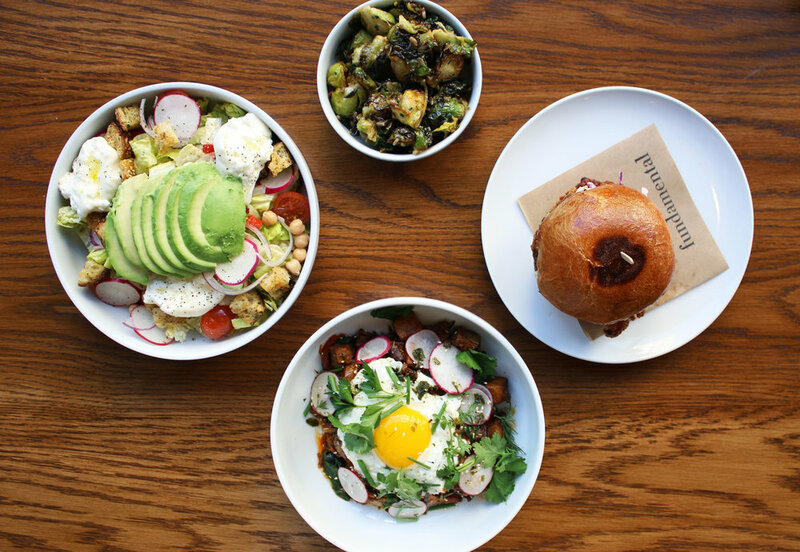 Though downtown already has a bevy of lunch options for the 9-to-5 crowd to choose from, we always welcome the addition a new all-day eatery, like the expansion of West LA's Fundamental into a new space on Grand. Offering breakfast and lunch (with dinner and cocktails coming soon! ), Fundamental DTLA deviates a bit from the intimate dinner concept of its sister restaurant. The space is bright and airy, with a marble bar, coffee counter, and both indoor and outdoor seating, making it a lovely place to escape the office for a satisfying lunch. We got the chance to sample from both the breakfast and lunch menu, starting with some of the lighter, veggie-driven items like the Burrata Salad (ok, cheese driven, but there were vegetables too! ), and the Brussels Sprouts. The Burrata Salad was a great lunch salad, with plenty of satisfying elements like the creamy cheese, avocado, and croutons, layered on top of crisp lettuce, radish, tomatoes, and more. We enjoyed their light take on brussels as well, which boasted lemon zest and a citrus honey vinaigrette instead of fried elements or the overly sweet sauces that other restaurants tend to drown their brussels in. From the breakfast menu, we were compelled to try the House-Smoked Brisket Hash, which was really tasty. Crispy potatoes were a lovely textural counterpoint to the tender brisket, while a fried runny egg was the perfect way to top it off. Definitely a comforting bowl to get you through any tough workday. Finally, the Fried Chicken Sandwich was definitely a "must." The chicken was lightly fried and not overly crunchy or oily, while the toasted bun was a nice bite. Overall, our lunch at Fundamental was really enjoyable. All the food was tasty, and the variety of both heavier, more substantial dishes with a few lighter options makes it a great everyday lunch spot for meetings, a quick bite, and the like.